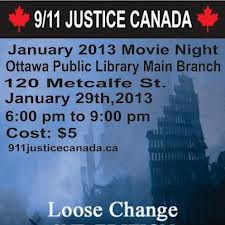 On Tuesday, January 29, 2013, I accepted an invitation to attend an event at the Ottawa Public Library, Main Branch, 120 Metcalfe St. that was hosted by 911 Justice Canada. First we viewed the 12:00 minutes video clip of 911 Justice Canada supporters attempting to follow up with Paul Dewar regarding the 911 Petition that was submitted to his office. Paul Dewar is the Foreign Affairs Critic for the NDP (New Democratic Party) - the official opposition party in the Parliament Of Canada - therefore the key person to submit the 911 Petition to the Parliament of Canada. View the Canadian 9/11 Petition: History, Follow Up With Paul Dewar. Paul Dewar is shirking his duty to (a) his constituents in his Ottawa Centre Riding and to (b) the people of Canada for refusing to submit the 911 Petition to the Parliament of Canada. Next we viewed "Loose Change 2nd Edition" and this was followed by a lively discussion among all of those who attended the event. Everyone agreed that we must stay focused on continuing the research and sharing the knowledge with those "who don't know they don't know" if we are ever to set ourselves free from the plans that the New World Order elitists have for us. Why is it so important that the "truth" be exposed to the Court of Public Review about the vile crime committed on September 11, 2001? These words from the "Emergency Truth Convergence 2005" offer an answer: "The Fear Ends Here. We urge you again to throw out your fears and embrace the joy and glory of working together as brothers and sisters in a common cause. Let us unite with all who choose to join us and sound an alarm as well as a declaration that we are free and in charge of our own destiny as awakened and empowered citizens shaping a better world. A post-9/11 truth world has a huge upside for all of us - let's keep our eyes on that silver lining beyond the dark clouds currently surrounding us." On September 11, 2001, I immediately knew that the evil crime committed on that day was an "inside job" - complete with its hidden agenda. On September 12, 2001, I authored an article titled "The Day After" and I still stand by what I wrote on that day. While this blog is dedicated to exposing the lies, deceits and deceptions about (a) modern money creation in general, and (b) more specifically, the evil and immoral effects of the design flaw of usury on our orthodox, economic system of usury-based, debt money along with (c) the good news about the usury free time currency movement, I also recognize the importance of continuing to be involved in the 911 Truth Movement. If the 911 Truth Movement can expose the lies about the events of September 11, 2001, then maybe that will pull out the bottom card in their (the New World Order elitists) house of cards - constructed with usury - and then the phoenix of usuryfree time currency can rise from the ashes and everyone on planet earth will experience the reality of a usuryfree lifestyle. I am convinced that the truth about the outrageous criminal act of September 11, 2001, must be exposed and therefore, I recommend that wherever you live - find out which local group promotes 911 Truth and make a commitment to attend local events, connect with like-minded thinkers and continue (or begin) your own self-imposed research on 911. I have posted a few graphics about 911 at this page at Facebook: "9/11Deceit, 9/11Deceitism and 9/11 de-Deceitization of Society." In Ottawa, Ontario, Canada, "911 Justice Canada" has been very active. They have prepared a 911 Petition that is ready for submission to the Parliament of Canada. They have also prepared a "Letter To Canadian Members of Parliament" which is also posted at my blog at this link. Readers from Canada are invited to make a master copy of the "Letter To Canadian Members of Parliament" and then make copies for other members of your family, as well as friends, neighbours, working colleagues, etc. and invite them to multiply and duplicate your efforts. 911 Justice Canada has prepared a special page for Paul Dewar. Readers are invited to visit and share your comments. 911 Justice Canada prepared a Facebook page titled: "911 Petition Follow Up With Paul Dewar" - where anyone can visit and add comments. And anyone and everyone is invited to go directly to Paul Dewar's Page at Facebook and share your comments and/or ask Paul Dewar why he will not submit the 911 Petition to Parliament since he is the NDP critic for Foreign Affairs.